On December 7, 2015 the European Commission (EC) adopted a new Aviation Strategy for Europe that “will enable European aviation to flourish globally.” The EC framed an all-inclusive policy encompassing the entire EU aviation ecosystem. The new Aviation Strategy contains a list of priorities geared towards making the EU a leading stakeholder in international aviation by tackling restrictions on growth both in the air and on the ground, promoting EU safety and environmental standards globally, and by advancing carbon neutral growth through innovation, digital technologies, and investments. The claimed added value of the Aviation Strategy is that it provides – for the first time – a comprehensive road map towards a more competitive EU aviation sector, and in turn, comprehensive coverage of all areas of EU aviation policy. Two takeaways are particularly noteworthy. The EU intends to tap into the “new growth markets” through the adoption of a series of external aviation agreements with key countries and regions. This should allow for better market access, and improved global connectivity based on a clear regulatory framework. Furthermore, it aims to explore untapped market opportunities from within by addressing capacity, efficiency and connectivity constraints. 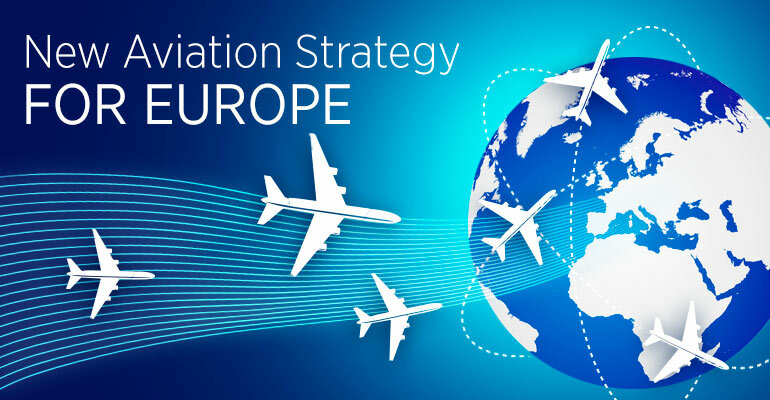 As the EC notes “the fragmentation of the European airspace costs at least €5 billion a year and up to 50 million tones of CO2.” For this reason, the Aviation Strategy underscores the significance of completing the Single European Sky project by optimizing the use of Europe’s busiest airports, and monitoring intra-EU and extra-EU connectivity to identify shortcomings. A more in-depth analysis will be provided soon. You can learn more about the new Strategy here.